PURCHASE THE BOOK AND GET STARTED WRITING YOUR SONG IMMEDIATELY. PURCHASE THE BOOK AND ADD ONE OR TWO WRITTEN SONG EVALUATIONS FROM RANDY KLEIN. PURCHASE THE BOOK AND ADD A PRIVATE COACHING SESSION WITH RANDY KLEIN. ALL BOOK BUNDLES ARE AVAILABLE AT A DISCOUNTED PRICE. 20% OFF LIST PRICE FOR A LIMITED TIME! 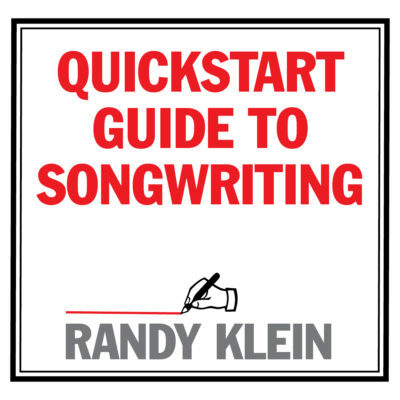 QUICKSTART GUIDE TO SONGWRITING WILL SHIP 24 TO 48 HOURS AFTER PURCHASE. An additional charge for international shipping is applied to all orders outside the US. If you are purchasing from within the US, please click here. If you’ve purchased a book bundled with Written Song Evaluations, please submit your songs through the form on the Written Song Evaluations page.